Mary O’Connor & Company accepts donations at their St. Charles office in September. A local Fox Valley business is taking the lead in organizing an assistance effort for victims of Hurricane Harvey in the Greater Houston Area. 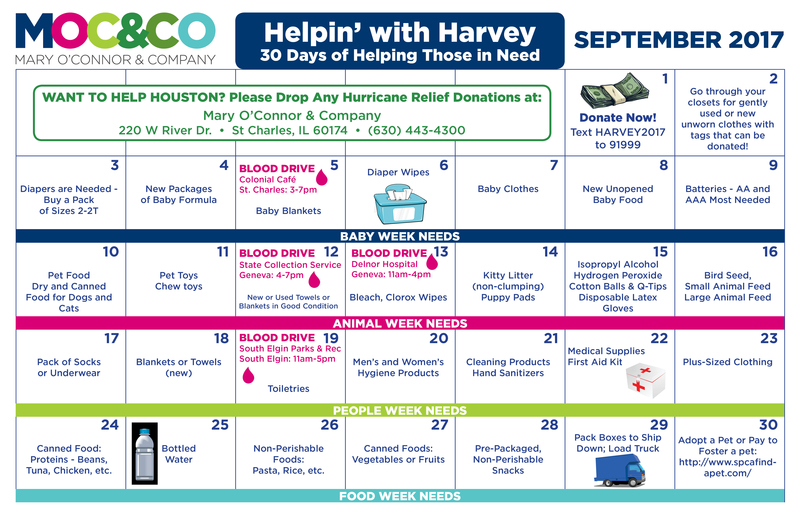 Mary O’Connor & Company (MOC&CO) is encouraging local residents and businesses to help in big and small ways by dropping off or shipping items to their St. Charles office for delivery to the Greater Houston area. The goal is to fill an 18-wheeler truck, which is being provided by a partnering business. Helpin’ with Harvey Calendar lists needed items for babies, people in general and animals as well as non-perishable foods. 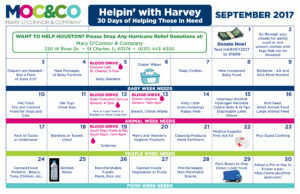 Calling its compassion campaign “Helpin’ with Harvey: 30 Days of Helping Those in Need,” the company has created a calendar of giving suggestions for each day during September, closing the month on Friday the 29th when they will prepare all collected items for shipment to the Greater Houston area. They are also encouraging tax-deductible monetary donations through the Greater Houston Community Foundation. The calendar highlights local blood drive dates and locations as well. The giving calendar can be viewed on the company’s website HERE. Items suggested address the needs of babies, people in general and animals as well as non-perishable food items. Those who wish to help can donate anything they wish on any day. The calendar is simply a way of conveying what is most needed, according to the company’s research. Donated items should be brought to the MOC&CO office at 220 West River Drive in St. Charles, in the Timbers Professional Center off Route 31, across from Boy Scout Island. Drop-offs will be accepted Monday through Friday between 8:30 a.m. and 5:00 p.m. Other times may be arranged by calling the office at 630-443-4300. As an alternative, contributed items can be ordered online and shipped directly to the MOC&CO office. The MOC&CO team is no stranger to helping communities in need. 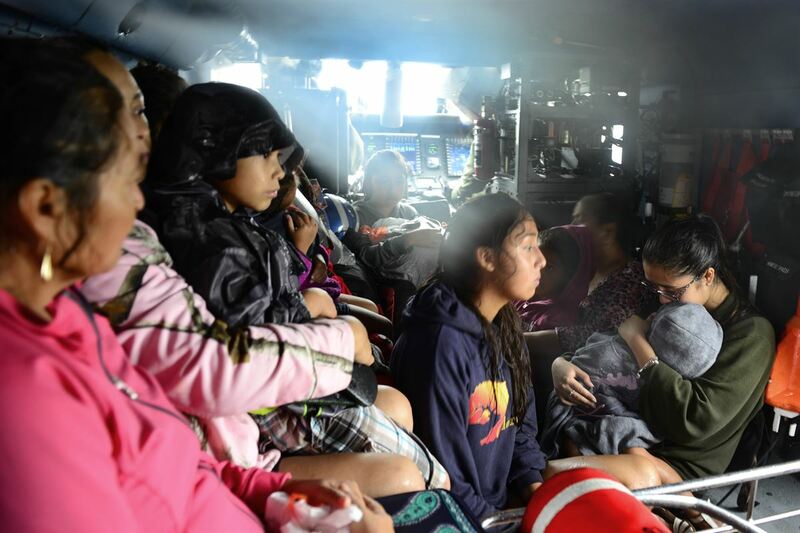 The company adopted a family and drove carloads of supplies to their aid when an EF4 tornado virtually wiped out Washington, Ill., in 2013; and it was charged with finding temporary housing for a major food service chain’s employees in Hurricane Katrina 12 years ago. O’Connor has encouraged her employees to get behind multiple causes over their 22 years in business including breast cancer research, military support, animal welfare and an Aurora-based home for the disabled. MOC&CO is a certified Women’s Business Enterprise that provides strategic meeting and event management services for its customers worldwide. Since its inception in 1995, the company has become a leader in the meetings industry and offers procurement and site selection, registration management, pre- and on-site event planning services. Its main operation is in St. Charles, Ill., with satellite offices in Seattle, Wash., and Jacksonville, Fla.
© 2019 Mary O’Connor & Company. All rights reserved.